Elvis Enthusiasts Unite: Guess where I am? I can't explain it, but here's my attempt at trying: Seattle is home to me. It makes little sense to say this, as I've never lived here. And, yet, every time I come back (annual visits for the past three or four or five years in a row now), I feel like I'm wiping my feet on the welcome mat. I get incredibly excited. And, yes, there are friends in my midst here that I know and am connected to in that strong Superglue kind of bond, but this city evokes a feeling in me. Is it the weather or people or something else, something undefined? Regardless, my heart resides here. Or perhaps it just swells a titch with happiness when I near its borders or walk its streets and contemplate setting up a makeshift bed and living in a Tully's coffee shop for a decade or more? I dunno. But I turn all goofy and want to hug strangers. Anybody else have a particular locale that does a similiar thing to them? And what does it for you specifically? I just may be the odd man out on this one, but I'm entirely okay with that. That said, I am currently here for Bumbershoot, as I've said before. I'll be here for the next four-and-a-half days, walking amongst those who reside here and taking a big enough drink of the area to last me another year (or at least six months). If they were handing fairly respectable writing jobs out like free puppies from box, I'd say 'Make mine a double please' and have the rest of my stuff sent after, and that's the honest truth. If you could see me right now, you'd see a fairly peculair smirk on my face. I just can't appear to keep it in. Your wife might be there. Maybe you can sense her near. That would be coooool. I feel that way when I'm in Salt Lake. I thought it was because of Temple Square, but maybe it's because you're my husband. I feel that way in the Grand Canyon. . . maybe it's cause our grampa hung out there. I wonder what other ways we're related? actually i feel that way about seattle myself - well maybe it's different. it's my holiday world - like a dream. in fact, once when flying in and looking out that window and loving it i had a sudden sinking feeling that i could not stay there. it was so weird and unexpected i went to the bathroom after deboarding and had to reassure myself that i was just visiting. 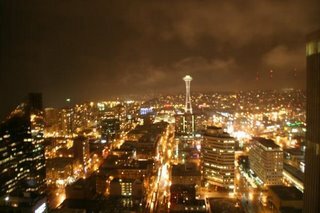 ahhhh, i love love love seattle. i can't wait to hear the full report on bumbershoot! i have the same thing with london. i can't wait to be there again in 6 weeks and live there next year. mine is vancouver island. i have lotsa fond memories of different trips with different family members. plus, the ocean makes me feel calm and i get this different sorta peace.